This means that policies that must be enforced for all are found first. If no match is found, the tenant-specific policies are checked next. Because of this, tenant administrators can override policies set by the central administrators where allowed, that is, policies located in the Global, can be overridden table. 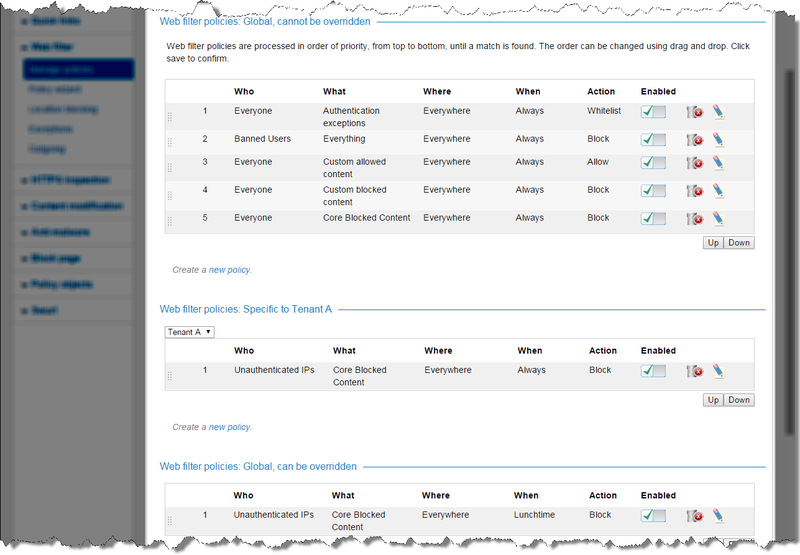 Use the Manage policies page to specify the order Guardian applies the web filter policies. 1. Go to Guardian > Web filter > Manage policies. a. Drag and drop the policy to where you want Guardian to apply it. b. Highlight the policy, and use the Up or Down buttons to move it to where you want Guardian to apply it. For example, if you have created a policy which allows media students to access advertising content during their lunch break and another that blocks all advertising content for all students, drag the media students policy to the top of the list of policies. Tip: For Multi-Tenant configurations, change the drop-down list at the top of the Specific to <tenant_name> to view other tenant's policies. Note: If you are using a Multi-Tenant configuration, you cannot move policies between policy tables even when logged in as the central administrator. Typically, you create new web filter policies using the web filter policy wizard. However, you can also launch the wizard from the Manage policies page. 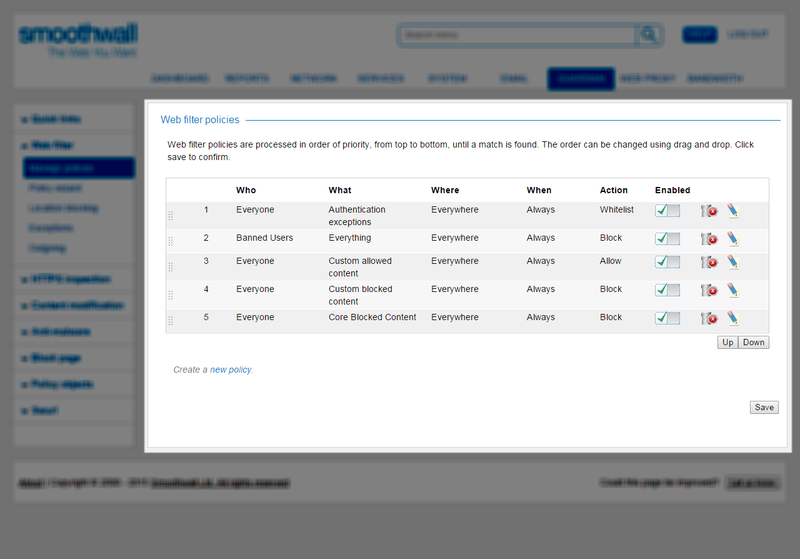 You do this by clicking the Create a new policy link at the bottom of the Web filter policies panel. For a detailed description of how to use the web filter policy wizard, see Creating Web Filter Policies . This takes you straight to Step 1: Who. 1. Locate the policy you want to edit. 2. Click the Edit policy button. Guardian displays the policy settings on the Guardian > Web filter > Policy wizard page. 3. Make the changes necessary, see Creating Web Filter Policies for more information about working with policies. 4. Click Confirm. Guardian displays the settings you have selected. Review them and click Save to save the changes to the policy. Guardian updates the policy and makes it available on the Guardian > Web filter > Manage policies page. 1. Go to the Guardian > Web filter > Manage policies page and locate the policy you want to delete.